Monkeys, like humans, belong to the primate order of mammals. Most monkeys live in rain forests and are arboreal. Biologists divide monkeys into two categories: Old World monkeys, which include species found in Africa and Asia, and New World monkeys, which refers to those that live in Latin America. Many rain forest monkeys live in groups, known as troops. The biggest and loudest monkey in the rain forests of Latin America is the howler monkey. Males can be up to four feet tall. Large vocal cords and a bony chamber under the throat allow them to produce a howl-like sound used to demarcate territory. Like most New World monkeys, howlers have a prehensile tail that can wrap around branches. 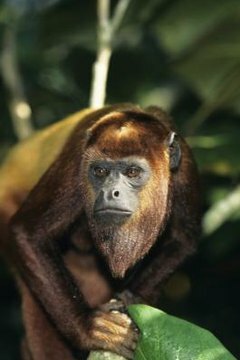 There are six howler monkey species, which are herbivorous. They eat leaves and the occasional fruit or flower. The coat of the capuchin monkey, found in Central and South America, is generally dark save for the cream-colored hair on its neck and shoulders and around its pink face. These small monkeys -- their maximum weight is about 9 pounds -- consume fruits, nuts, leaves, insects, frogs and small birds and mammals. Capuchin monkeys are considered intelligent and have been observed in the wild using stones to crack open nuts. The rain forests of southern Mexico, Central America and South America harbor seven species of spider monkeys, which can be identified by the white rings around their eyes. Their faces are hairless, while the rest of their bodies are covered in coarse, black hair. Though they lack thumbs, spider monkeys are agile when it comes to swinging from branch to branch. Fruits make up most of the spider monkey's diet. Macaques comprise a widespread genus of Old World monkeys. Species that live in rain forests include the crested black macaque of Indonesia, named for its Mohawk-like hair. One of the smallest species is the endangered lion-tailed macaque of India, the mane and tail of which resemble those of its namesake feline. Most macaques are omnivorous. The long-tailed macaque, found in the rain forests of Southeast Asia, the Philippines and Indonesia, eats crabs. All macaques have cheek pouches used to store food, a characteristic unique to Old World monkeys. "Colobus" is a word of Greek origin that means "maimed." In the case of the colobus monkey, it describes a missing thumb, an adaption that allows this highly arboreal primate to move swiftly among branches in the Central African rain forest. These monkeys have black coats with white hair around their faces and on their backs. The red colobus has patches of red-orange hair. Colobus monkeys eat young leaves and shoots. A chambered stomach allows them to digest vegetation that other monkeys cannot. The nine monkey species known as mangabeys inhabit the rain forests of equatorial Africa. There are two main types: white-eyelid mangabeys and crested mangabeys. Both are arboreal, but the former, which include the white-collared mangabey, the largest species, spend more time on the ground than the latter. Mangabeys have large front teeth that allow them to tear through the skin of fruits that other monkeys cannot penetrate. They also eat seeds and leaves. A mangabey's tail can be as long as or longer than its body.